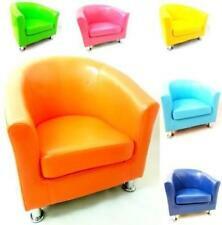 Features: Ergonomically designed, very comfortable to sit. 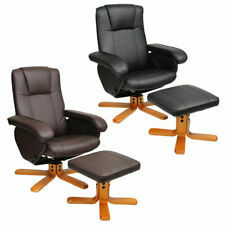 Comfortable Swivel Recliner in full hardwearing Leather (bond grade), has been developed to the very highest standards. Comes with massage function. Providing: strength, durability, supreme comfort and high quality workmanship. With its comfortable seating, ample back support. 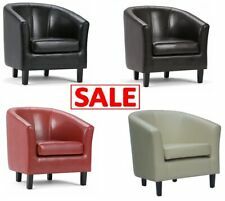 Tub Chair Faux Leather Armchair- Living room, Dining room, Office or Reception. FREE NEXT WORKING DAY DELIVERY - 6 Colours in Stock! Just put your feet up - comfortably relax on the well-padded TV armchair with footrest. This relax armchair is the right choice to spend restful hours by the fireplace or watching TV. The backrest can be quickly and easily adjusted and offers a comfortable seating / lying place when needed. whether in your living room or bachelor pad, this armchair from Tectake is sure to offer total relaxation..
Wing Back High Backrest PU Leather Armchair Accent Chair Sofa Lounge Living Room. 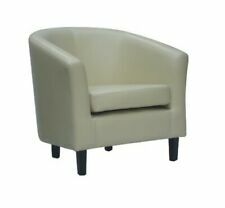 1x Living Room Accent Chair Armchair. Elegant Style - A beautiful accent chair with winged sides, a high back, stitching details, dark oak wooden legs. A Pair of ex-display conditions green fabric chairs only £50. Collection ONLY. Recliner Massage Armchair Heated Lounge Chair Rocker Swivel Footrest Sofa Beige. Recliner Armchair. Recline with footrest, massage and heating, rock and swivel. Recline to Maximum 150° with Handle. Adjustable Footrest Design. Recliner Armchair. Recline with footrest, massage and heating, rock and swivel, it must be what you wants and the most value for money. Recline to Maximum 150° with Handle. Adjustable Footrest Design. Faux leather wing back chair Oxblood. Condition is Used. I previously listed this as Leather as I thought it was but it turns out its Faux Leather but I never realised. It has a few marks and scratches but no rips. Comes from a smoke free house and is approximately 4 years old. It has seen little use in the last two years. New listingTwo brown, faux leather ,swivel recliner chairs . Two brown, faux leather ,swivel recliner chairs . . Condition is Used. Collection in person only. Sold as seen with more photos available on request . Paypal preferred . Collection in person . Features:Ergonomically designed, very comfortable to sit.The supple upholstery is made in stain resistant and easy-clean bonded leather allows that provides the soft touch at a great value. Perfect for living rooms, bedrooms, theater rooms.The chaise style seat gives an excellent leg support.Adjustable backrest recliner.Deluxe faux leather surface looks perfect, high qualified and luxurious.Slap-up sponge offers a good condition for your reclining.Cushion hei. 20 Colours Available! Fast & Free Delivery! UK Stock! CosmoLiving Arm Chair - Brown 90331. CosmoLiving Arm Chair With Reclining Feature & full 360 Degrees Swivel functions. High Quality Faux Padded Leather. Leather is extra thick to provide a more comfort Seating Experience. Tub Chair. Brown faux leather. Condition is Used. There are a couple of small scratches (see photos) but no tears or rips. Collection only from CV23 0NE. Cash on collection. 2 x Brown Faux Leather Tub Chairs. Condition is Used. Both chairs have hardly been used. One chair is in excellent condition, the second has slight oil type markings on the side, please photographs. The padding is firm with no sagging or tears. Very comfortable. Collection in person only. Cash on collection. Thank you. The MONTANA LOUNGE CHAIR is a very individual piece of furniture, which can be used in virtually any room of the house. Full 360 degree swivel capability. Height (base to seat) - 49 cm. A funky modern design. Stylish and elegant fabric tub chair York, lovely vintage style! , "Great chair", "Lovely occasional chair, nice material, looks far more expensive A ", "Brilliant item. As described. Great colour and very comfy. Different colours available! It has been made out of brown suede like fabric which has a really smooth and soft feel to it. 4.5 out of 5 stars - Stylish and elegant fabric tub chair York, lovely vintage style! 6 product ratings6 product ratings - Stylish and elegant fabric tub chair York, lovely vintage style!